and it's expensive for the taxpayer." Download our oversight report here. Watch our 5-minute segment here. In America today, the administrative state and our expansive federal workforce perform a critical and sometimes controversial role in our society. The center-left sees value in establishing federal programs to help the "little guy" through a wide-ranging and expert federal workforce. The center-right, on the other hand, argues elected officials have delegated too much power to the federal bureaucracy, which now poses a threat to individual liberty and private sector prosperity. Modern Washington, D.C., which is a nexus between the federal bureaucracy, special interests, and elected offices, has been nicknamed "The Swamp." 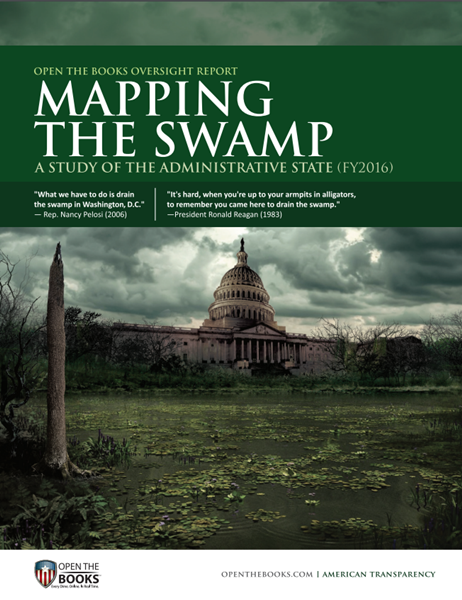 Our OpenTheBooks Oversight Report - Mapping The Swamp, A Study of the Administrative State (FY2016) reveals the size, scope, and power of the federal government. After just 3-years of employment, federal bureaucrats receive 43 paid days off - that's 8 1/2 weeks! We estimate this perk costs taxpayers $22.6 billion annually. A new 'minimum wage' for federal employees: at 78 agencies, the average employee made more than $100,000! Presidio Trust - a small federal agency in San Francisco - paid out three of the four largest bonuses at the federal government, including the largest in FY2016. The biggest bonus ($141,525) went to an HR Manager in charge of payroll!